Should you use emojis customer service delivery? HomeImprove the CXShould you be using emojis in customer service? 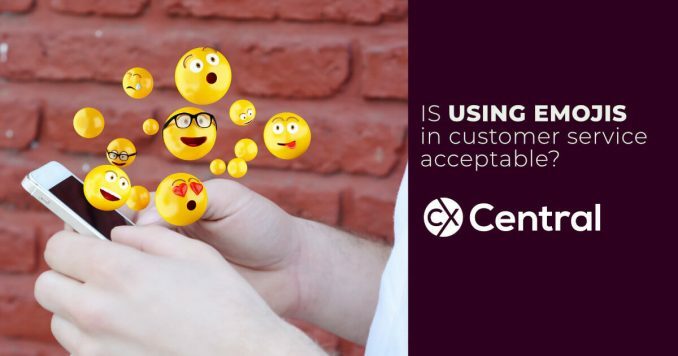 Is using emojis OK in customer service? Since their creation, emojis have grown in number and popularity. They’ve sparked a range of merchandise and even a movie, and they’re used in online communications every day. This popularity begs the question: should you using emojis in customer service communications? Emails, live chat and social media seem like the best candidates for potential emoji use. Your customers already use emojis across these platforms, after all. But are emojis suitable for customer service, or simply too informal? Emojis were invented around 20 years ago in Japan by Shigetaka Kurita, and ‘emoji’ literally translates to ‘picture letter’. They’re used to provide the tonal information that would otherwise be missing in textual communication. Emotions are universal, yet conveying them through text alone can be incredibly difficult, particularly in short customer service interactions. Emojis answer this difficulty by indicating the intended tone of a message. Building rapport with a smile is no longer limited to face to face interactions – you can use a  in an online message to strike that friendly, open tone. Emojis are even being cited as a global language. After all, everyone understands that a smile is positive, welcoming and friendly. So, by using emojis, you could appear friendly worldwide, and supply the tonal cues missing in your current online customer service communications. There are, however, some dangers of using emojis in customer service. From annoyance to alienation, the incorrect use of emojis can stifle the customer experience, and hurt your brand. One risk of emojis was demonstrated flawlessly by House of Fraser, with their ‘Emojinal’ campaign. Their overuse of emojis caused confusion and incited criticism from customers, all of which was aired publicly on Twitter. This is a prime example of emojis and customer service not mixing well. House of Fraser’s failure also demonstrates the importance of considering your brand identity and tone of voice when communicating with customers. Will emojis provide some extra seasoning, or contradict your branding and hurt your credibility? Finally, while 68% of millennials prefer to communicate emotionally using images like emoji, the same can only be said for 37% of customers over 65. The use of emojis – specifically the overuse of emojis – means running the risk of alienating your older customers. Using emojis are great for supplying the missing emotion in customer service communication. Unfortunately, misunderstandings can still occur with emoji use. Emojis appear differently across devices, and humans are so attuned to pick up on facial features, that even these slight variations can mean different interpretations of the same emoji. It’s also important to remember that emojis are just tiny pictures, and they’re interpreted subjectively. For example, a  could be a friendly fist-bump. Or it could be interpreted as an aggressive punch. It’s best, for this reason, to stick to simpler emojis with clear meanings. The classic  is undoubtedly a friendly smile, ☹ is evidently an expression of sadness. Emojis that are clear – unlikely to have dual meanings – is the best to use in customer service communication. With all these potential issues with using emojis, it understandable why brands have been slow to adopt them for customer service use – you don’t want to risk offending your valuable client base. But, used right, emojis can add that extra, humanising sparkle to your conversations with customers. Messaging apps and social media are hugely popular, and many of your customers use emojis daily in their digital conversations. So, incorporating emojis into your customer service can help mirror the relaxed, friendly tone that customers enjoy with their friends and family. Used correctly, emojis can improve your communication by demonstrating to the emotionally intelligent customer that you’re on their side. You’re upset this bad thing happened too; you’re friendly and approachable; you’re capable of laughter and humour. An emoji can convey all these subtle sentiments in a click. Context will always be the key to effective emoji use. In general, it’s best to wary of  – it can be construed as creepy or overly suggestive. Then there are some emojis that’ll never be appropriate for customer service communication. , 濫, , and 郎 can all be viewed as perverse or rude, meaning there is no place for them in polite business-to-customer conversation. It’s important when using emojis to do so with your best judgement. It’s best to stick to the simple, classic emojis. Those that improved on the emoticons from a decade before will rarely offend:  and ☹, for example. In some situations, such as social media, the ❤ emoji can potentially be appropriate – if it fits with the context and your brand. Then, there are the emojis that support your brand or product. For example, Domino’s use of the  is both innovative and opportune. This kind of product-reflective emojis can be a great tool for marketing, and help your customers identify with your brand. Emojis provide a way to express things that some customers struggle to put into typed words. They give your brand a friendly tone of voice and particularly appeal to millennials. Successful emoji use relies on several contextual factors, such as customer emotion, company branding, conversation goals and even customer status. The crux of the emojinal customer service question is using them correctly. That means using clear, simple emojis sparingly, in the right context, with the right customers. Niamh Reed works in content creation at Parker Software, a leading UK software house that offers live chat software and business process automation to businesses worldwide. She spends most of her time writing articles spanning topics such as customer service and user experience. During her downtime, she draws, plays the violin, and hip-throws people twice her size in jiu-jitsu. Whats the difference between customer experience and customer satisfaction?